After an amazing couple of days in Somiedo National Park we jumped on the early bus back to Oviedo to catch another two to eventually arrive in Arenas de Cabrales for two days of walking in the Picos de Europa mountains. So the following day we went for a proper hike. We paid 7 euros for a taxi to Poncebos to the start of the Cares Gorge route. It was already scorching hot despite it being early morning so it didn’t take long to tire us out. 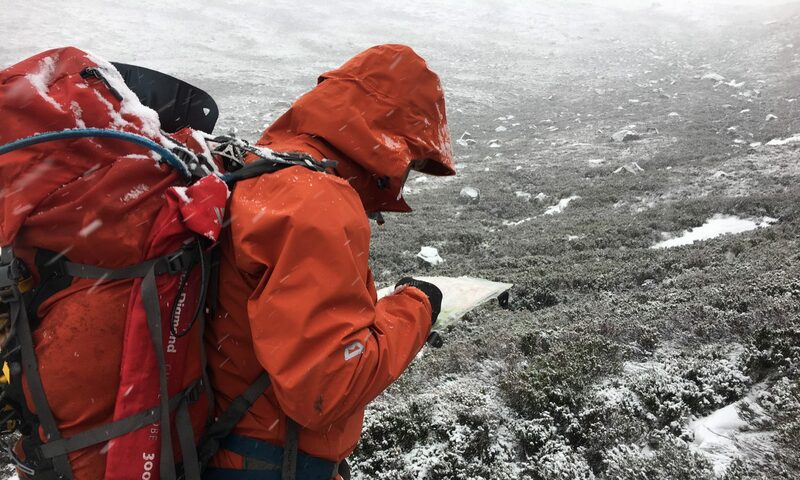 The route is simple to navigate as you just follow the only path there is, take care in wet or windy weather as it is a very long fall down into the gorge. Also, take lots of water if it is hot, as there is nowhere to get water along the way (the canals alongside the path are too high to dip a bottle into). 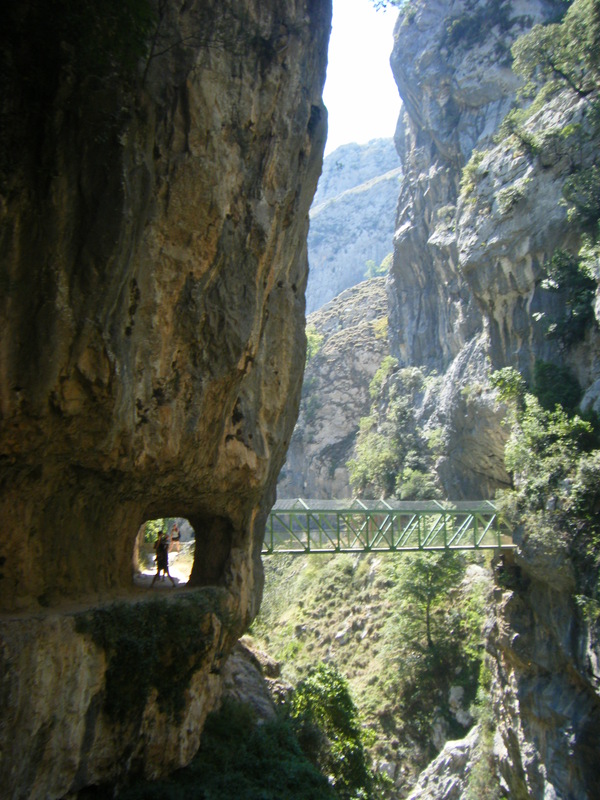 Its 12km before you get to the little village of Cain at the end of the gorge. 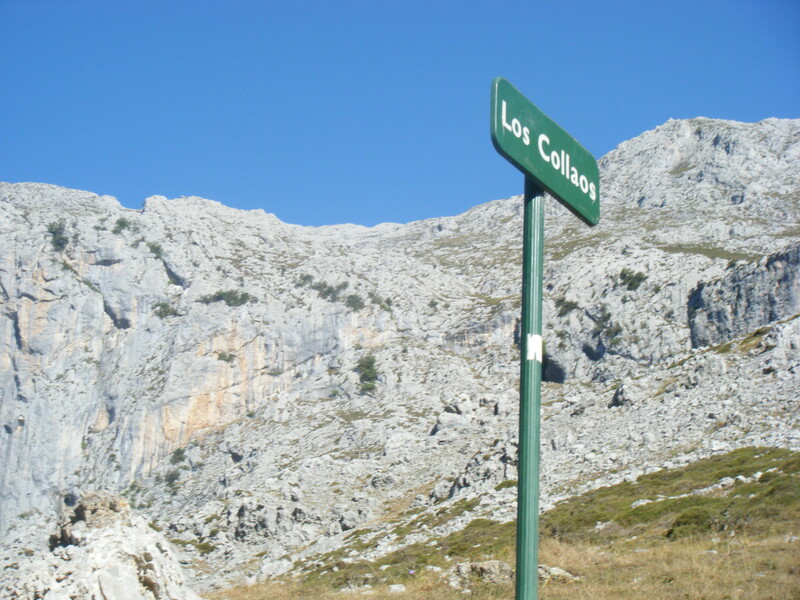 Los Calloas is the highest point of the route, its pretty much downhill or flat from there on. 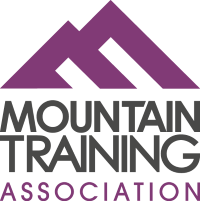 You can just see the path wind around the mountainside. 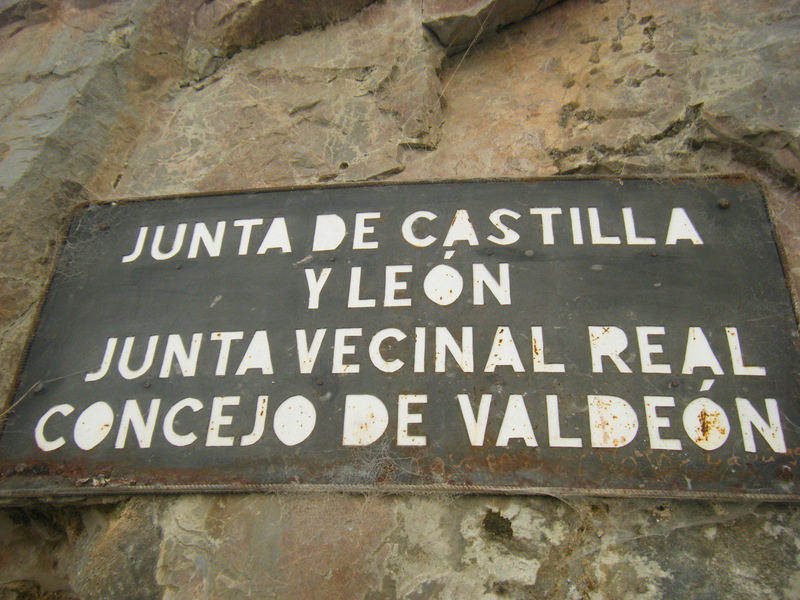 Along the route you officially leave Asturias and walk into the district/ region of Leon. We were too hot to be impressed to be honest. Eventually the gorge becomes less rocky and sparse (and dusty) and becomes lush with trees. And then the tunnels and bridges start to appear. Eventually the path meets the river and you arrive in Cain village centre. 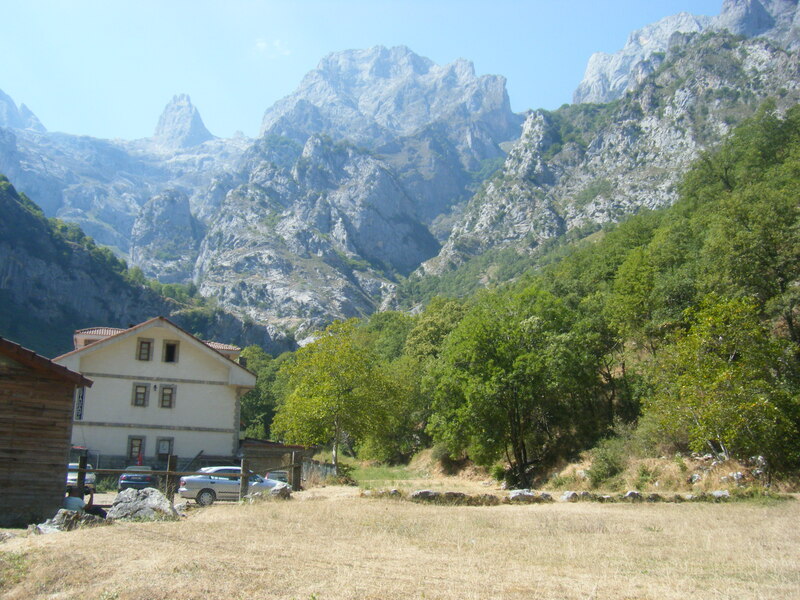 A wonderful little village surrounded by the mountains of the Picos de Europa national park. Now you need to know the following important fact that no-one seems to share on the net or even at the tourist information office, but we were glad to find out. It is possible to just walk one direction. Obviously this is only possible if, like us, you got a taxi to the start in Poncebos. However, so you avoid being ripped of by the multitude of taxis waiting in Cain, you need to arrive well before 4pm to catch one of the two little buses that run from Cain to Cangas de Onis. We would have been happy to walk back if it hadn’t been 35 degrees C but we lacked enthusiasm to walk from the lush end of the gorge back to the dusty sections, which also meant walking uphill. So it was wonderful to find out there was a bus we could catch. It is definitely worth getting there early as some people start at Cain and turn back, and there is only two little buses. So if you arrive early buy the tickets before you run for lunch or ice-creams. 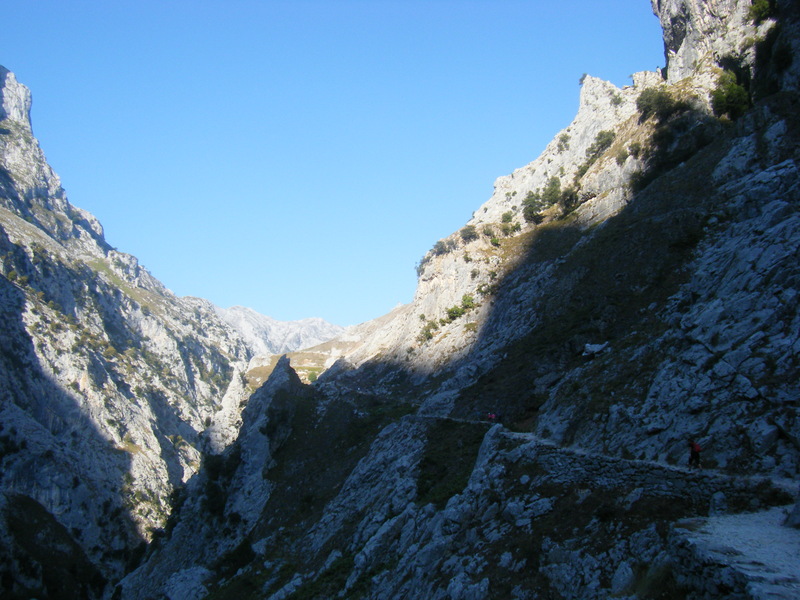 The bus ride was suprisingly worth it, to see the other side of the Picos where it is more forested, and to see snow still on the summits, even in September sunshine. It is also a bargain bus ride as it is less than 8 euros for a 1 and half hour bus ride. 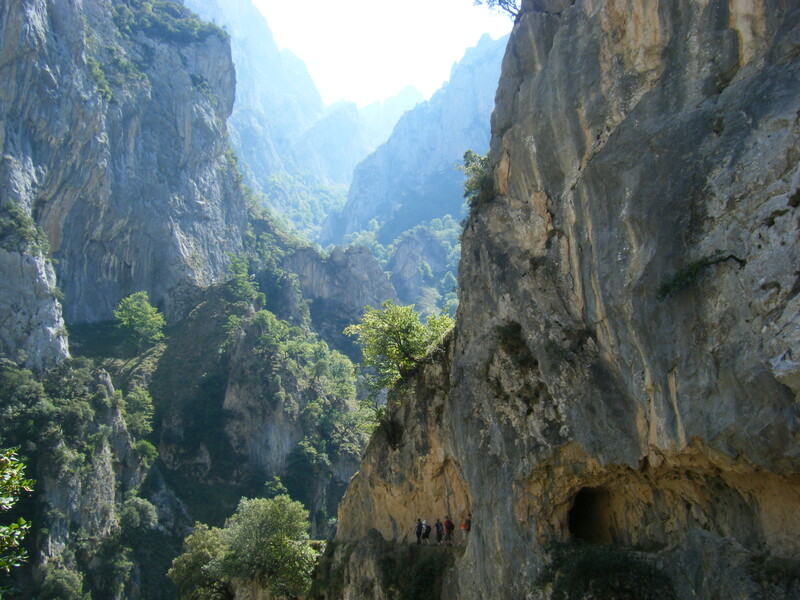 Cares Gorge on the Ruta de Cares is impressive and a great taste of the Picos de Europa mountains, I’ll certainly be back. 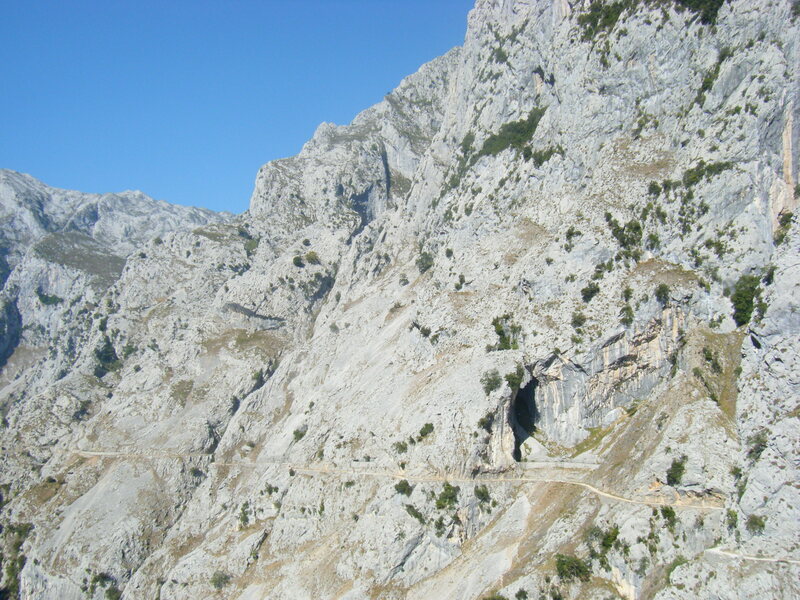 That gorge looks a worthwhile day out.I have never been to the Picos but have the nagging feeling I should as I pass over them on the airplane each year and they always look inviting. You can get cheap flights to Asturias from the UK so its worth a visit. The Picos are certainly on my list of places to revisit and as there is so many mountains to walk and loads of great low level walks too. Gorgeous! How did I not hear about this while I was in that neck o’the woods? Oh well, I’ll just have to go back. Thank you! Hi! I’ve been looking for information everywhere about the buses from Cain back to Poncebos without luck… do you know what times they depart at? And approximately how many hours did it take you to do the walk? Cheers! I don’t recall the times of the buses but I think it was around lunch when we got the bus, either 12 or 1 but I think they run until 3ish. The walk took us about 5 hours but we weren’t walking very fast as it was very hot. You need to get the bus to Cangas de Onis and then a bus back to Poncebos though. Next PostNext Rescue Ramble 2013 – 23 miles is not a ramble!